I have always loved bread. I love the smell of it baking. I love the feel of the dough in my hands. I love the way the butter melts when it’s spread on the bread right out of the oven. I love the actual work of making a loaf of bread from activating the yeast, to making the dough, to letting it rise, to punching it down for a second rise, to the proofing stage before it goes into the oven. 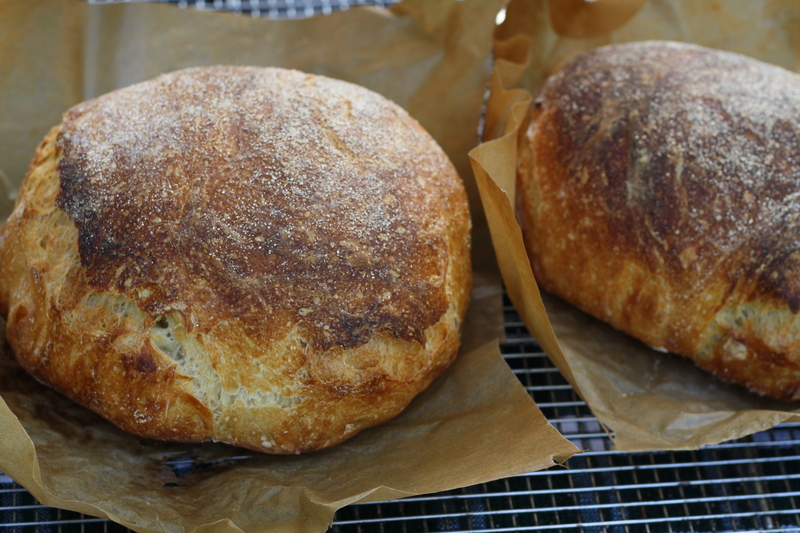 Today I baked bread the Jim Lahey way. That means I baked bread in a covered pot in the oven. 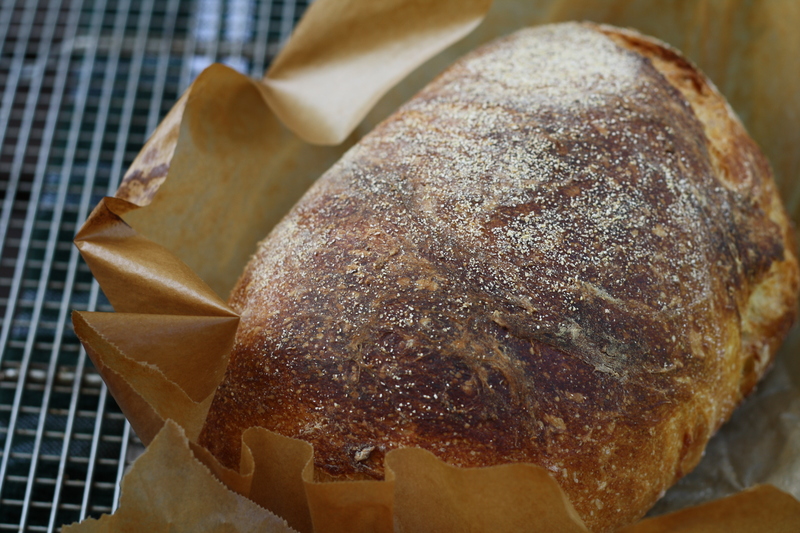 It’s the most amazing way to get a terrific loaf of bread with a thick ,crisp crust. 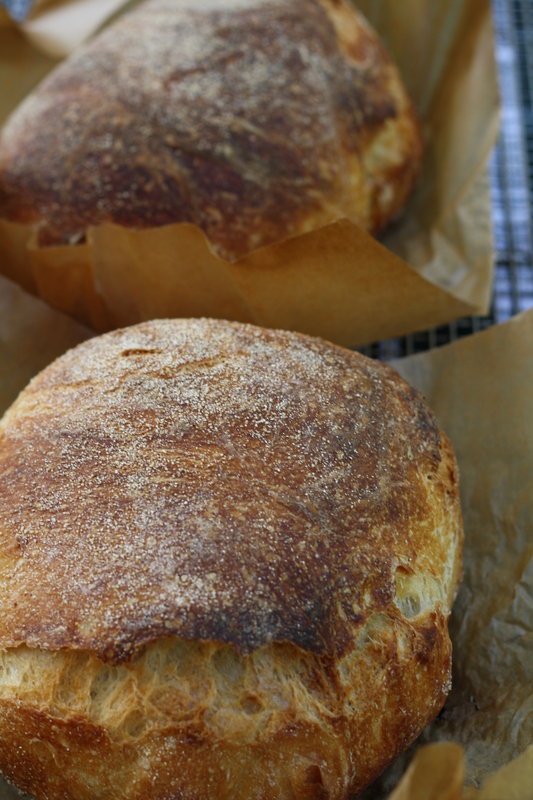 I have been baking this bread since Christmas when my wife bought me his cookbook (I should say bake book). The other great part of the Jim Lahey way is that you DO NOT KNEAD the dough. You simply mix 3 cups flour, 1-1/4 teaspoons salt, 1/4 teaspoon active yeast and 1-1/3 cup water. Leave this in a bowl covered with plastic wrap for 16 hours. You then form the dough into a loaf. Set it out to proof for about 2 hours. Pre-heat the oven to 475 degrees. Place a large covered pot or Dutch oven in the oven for at least 30 minutes. Put the dough gently into the pot. Try your best not deflate the loaf. Bake the bread for 30 minutes covered and then remove the lid for an additional 25 minutes. When it’s done let it rest on a baking rack. We made vegan sandwiches with the bread today. We spread tapenade on the bread. We then layered it with grilled eggplant, roasted red peppers, smoked tofu, fresh basil, tomatoes off the vine in the backyard, Kosher salt and ground pepper. We also made grilled roast turkey and jalapeno jack cheese sandwiches with dijon mustard. It is so easy to make so give it a try. If you have any questions let me know. my mother just checked out a book about learning to bake your own bread. i’m excited to try it with her. She’s a vegan cook who swears by the same Jim Lahey method of bread which she has tweaked a bit. If you scroll down the recipe list, there is a bread section and she has ones for ciabatta and baguettes down in the pot. Anyways, see you over on Flickr! Thanks for the nice post. I will definitely check out her website. I love these posts although its nearly tea time here and you are making me hungry. The bread would be perfect with a cup of tea and a bit of jam on the tea. Hi, I’ve mentioned your blog in my latest post. Hope you don’t mind? Grazie. I will take you up on the offer.